Millennials are saying goodbye to the old and traditional looks of wooden doors that their parents once had. Today homeowners are adding a pop of color to their curb appeal by painting their front doors. This simple DIY project is also a great way to save homeowners money and time. Of course, choosing a color is not an easy task with so many different variations of one specific color. So what colors are the most appealing to both neighbors and homeowners you may ask? After doing some research on my own, I discovered that these following colors are trending for 2018. 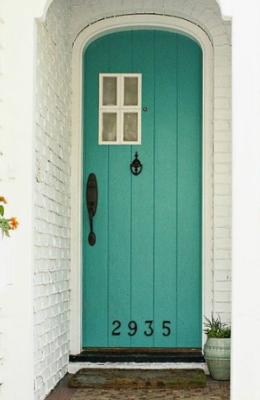 1) Teal- No matter if your home is white or grey, a teal door can accent your home in such a fun way. 2) Yellow- The color yellow is such a happy and welcoming color for any guests arriving at your door. 3) Indigo- While this may not be the ideal color for all homes, for the right craftsman style house & owner an indigo door can really pop! 4) Black- The color black is making its debut and it is here to stay, from black windows to shutters and now, doors! Black home accents is a great way to finish out a modern looking home. 5) Red- Everyone loves the classic look of red lips, and now that classic statement is making its way to front doors throughout the USA! If you are ready to take the plunge this weekend and update your front door, head over to your local paint store for supplies. While at the store, be sure to ask an associate for any helpful tips and tricks to make this DIY project, a smooth one!